Frilly green leaves with a delicate appearance, attached to crunchy stalks. It's intense licorice taste marries well with all seafood dishes. Ideal fresh flavor addition for sauteed sea scallops. 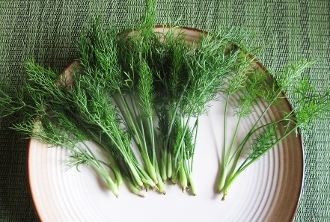 Creative bartenders can find a use for these tiny fennel stalks in herb-inspired cocktails. Also pairs well with lamb plates. Stick in whipped potatoes to stand up straight and add dimension.